I have loved creating and leading all my weddings, and am proud to share some of the photos and feedback from my lovely couples! For more reviews and testimonials take a look at my listing on Hitched.co.uk and also on my Facebook page and here on The Celebrant Directory! I was so excited to be asked by Sara and Robert to create a Ceremony for them at the iconic Swan Globe Theatre, in the heart of London’s South Bank and near all the beautiful iconic landmarks in this beautiful city. Leaving their warm sunny Florida home behind, they opted to have a winter wedding which was definitely warmed by their love for each other and the love that was present in the room, as they both said their personal heartfelt vows and promises to each other. I was delighted when Sara gave me permission to publish her short wedding video, which was lovingly curated by Diana V Photography! Thank you both! Sara & Robert at Shakespeare Globe from Diana V Photography on Vimeo. Maria and Rav held their summer wedding this year in the garden at Rav’s parents home in South London, and it was a beautiful fusion of styles, colours, music and food – Maria is originally from Germany and Rav has an Indian heritage. We had a beautiful Rose Giving Ceremony for their mothers, followed by personally written vows and welcome and storytelling in both English and German – making it a wonderfully personal, inclusive and intimate occasion! 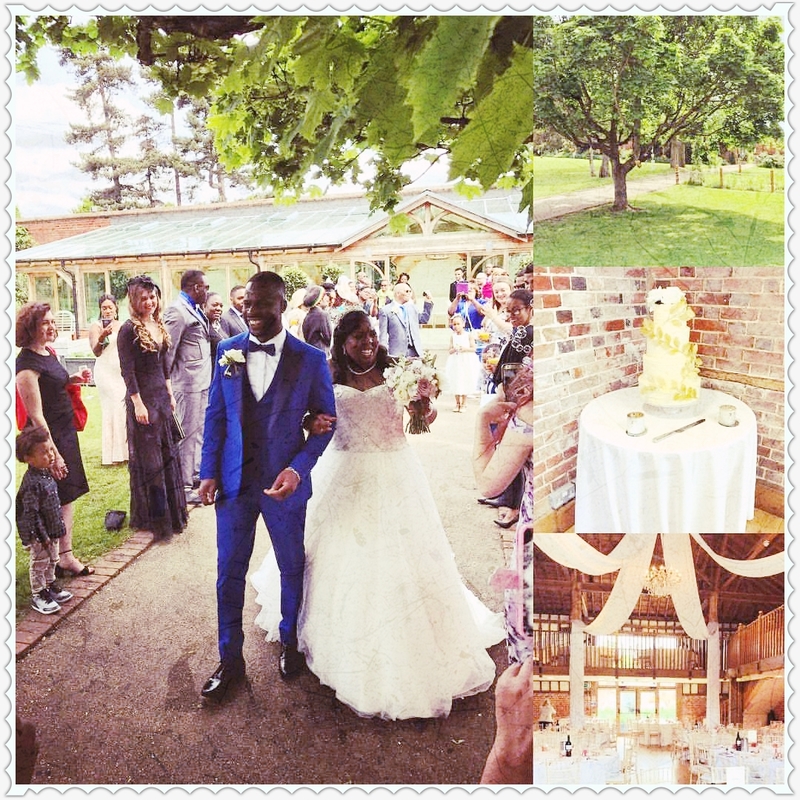 Abigail and Andrew’s wedding was held at the iconic Asylum Chapel Peckham – classic elegance met urban chic in a beautiful fusion and their wedding was featured on the fabulous RMW blog Here I was proud and touched by their feedback after the wedding ceremony! I had the greatest pleasure in creating a handfasting ceremony for this lovely couple, who flew over from California with their guests, and held their ceremony outdoors at the beautiful Great Fosters, Egham, venue. It was a stunning location as you can see! Congratulations to B and S – I hope you have many wonderful memories !! Camille and Diarmuid had a wonderful ceremony with guests from Europe and Great Britain – held at the iconic Soho House, Berlin. With a beautiful Ring Warming Ceremony, and romantic vows, it was a truly stunning and heart-warming occasion! It was so lovely to receive this handwritten thank you card from the bride that day – it really was an honour and a great pleasure to create and lead this ceremony! A gorgeous setting earlier this year, for a Chinese couple, at Amberley Castle, Kent this summer, made so much more beautiful by the fact that the ceremony was translated into Mandarin too! Ignas and Norberto had a beautiful woodland themed Wedding at The Dead Dolls House, Islington, after their legal service at Islington Town Hall. Augusta Florals created magical fairy tale setting for this lovely couple and their guests. It was a real pleasure to help them with their personal vows and promises. A ceremony full of wonder and romance! Jenny and Mark’s wedding was held in a beautifully decorated barn! More lovely photos creating many memories to cherish! Celebrant Ceremonies can be conducted almost anywhere ! From the luxury of the Ritz Hotel for Rosie and Stepan’s Wedding, to the rustic natural outdoor setting in an Animal Sanctuary for Mark and Jenny. Anything is possible! The lovely couple below held a super stylish ceremony at the Grand Palace Banqueting Hall in Wood Green, London ! It was an amazing day with the bride writing her own poem to her handsome groom, – not a dry eye in the room! Her feedback was very much appreciated! A Sand Ceremony was the chosen symbolic Ceremony for the wedding of Holly and James, and their Thank you Card was so sweet and appreciated! The Ceremony was in the lovely London Hotel, Montague on the Gardens, in Bloomsbury! They had a beautiful elegant ceremony at Wrest Park, a National Trust property, in Bedfordshire. ‘Let me just say I absolutely loved the script, it’s amazing, it brought a tear to my eye which was lovely. I’m really pleased we picked you to perform this for us, i think it will be super special’. Dear Yvonne, Thank you for a wonderful day and a fantastic service at our wedding. We had the best time ever and just want to do it all again! I performed their Ceremony at the pool, which was Caribbean styled, complete with Steel Band, at the stunning Sheraton Skyline Hotel, Heathrow which is where they first met and fell in love! I married two lovely guys in a fun ceremony that was full of love and laughter. Congratulations to Mitch and Jame Tanner-Thorpe who tied the knot at Pembroke Lodge, Richmond, a wonderful National Trust treasure! Thanks, you’ve done a wonderful job!”. Their Ceremony was held at the Old Mill Inn, Aldermaston outdoors, and incorporated a Groom’s Surprise! The day went very well and the bride and groom had a great time! Thank you for everything you were fab! I conducted the ceremony in front of a herd of 30 bulls and cows at Hugletts Animal Sanctuary in East Sussex. They were so curious about me and what I was doing in their field we have some rather fun pictures of this day! Who knew they love GingerNut biscuits!! A lovely warm ceremony blending two faiths in a creative and respectful yet romantic story. I presented the family with a beautifully printed script of their wedding and vows as a keepsake. Ceremony was conducted at The Amadeus Centre, Maida Vale, London. Thanks for a great ceremony on Saturday a lot of people commented on what a lovely service it was. All the best, Hannah and Aron. Hi Yvonne, I just wanted to drop you a note to thank you for all the services you provided for Ruby’s Naming Day on Sunday 7th August. We all really enjoyed the day. The ceremony felt really personal and the words you provided were lovely. The tone of the ceremony was perfect – a serious occasion, which didn’t feel too formal. Many of our guests commented on what a lovely ceremony it was and how nice and personable you were.